EVS Metal, an American manufacturing leader specializing in precision metal fabrication, recently added a wide-range of capabilities to its already impressive roster with the purchase of an Amada Laser Cutting System with Rotary Index. This system features unmatched speed, accuracy and stability, giving EVS' Keene, New Hampshire facility the ability to process an incredible array of material thicknesses easily, including a variety of tubing and pipe. Amada’s reputation for quality made the FOM2 3015 NT RI an easy choice. It will allow our operators to maintain the tight tolerances and quality standards for which EVS has come to be known, all in a single handling. 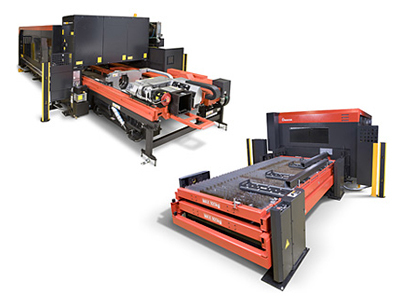 EVS Metal, Inc. has added an impressive new fabrication system to their New Hampshire manufacturing facility: the Amada Laser Cutting System with Rotary Index (FOM2 3015 NT RI). This integrated cutting unit is considered the most versatile rotary index system available. With its expanded process range, high-speed cutting head, outstanding accuracy and industry-leading stability, the Amada is a welcome acquisition to an already-impressive lineup of machines available at EVS’s New England-based and ITAR-certified operation. Why did EVS Metal choose this particular machine? In a word, precision. In particular to achieve the exact, detailed cuts required for the large number of frames that are requested by customers. Said EVS Vice President and Co-Founder Joe Amico, "Amada’s reputation for quality made the FOM2 3015 NT RI an easy choice. It will allow our operators to maintain the tight tolerances and quality standards for which EVS has come to be known, all in a single handling." The Amada Laser Cutting Machine consistently produces this high level of accuracy for several reasons. The rotary index gives it the power and speed to efficiently cut even thick materials easily, including a significantly wider variety of tubing. Impressively, due to the location of cutting head (close to the chuck), the dead zone is minimized, allowing even bowed pipe or tube to be precisely cut from end to end without the use of vibration. The Amada is capable of processing almost any shape, from round or square to C-channel and angle iron, and when utilized in concert with the included Dr. Abe_Tube software, even fabricating complex tubular structures for welding is simplified. EVS Metal provides end-to-end manufacturing and logistics services to companies throughout the United States. A leading metal fabrication, machining and finishing shop, EVS also offers integration services, various stocking programs and design engineering support. EVS Metal is a privately held corporation, headquartered with a manufacturing facility in Riverdale, New Jersey and with additional facilities in Pflugerville, TX, Keene, NH and East Stroudsburg, PA. Recognized for its world-class manufacturing processes, EVS has enjoyed tremendous growth, fueled by a commitment to both quality and customer service. For more information, please visit http://www.evsmetal.com or call (973) 551-1890 to speak with a representative. Amada's FOM 23015NT RI Laser Cutting System with Rotary Index recently went online at EVS Metal.